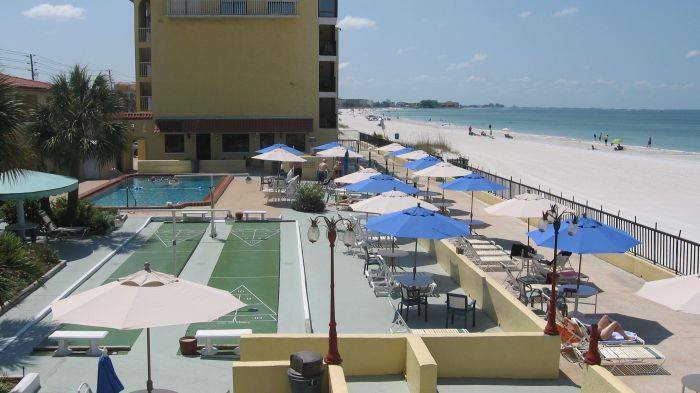 Garden King Studio Enjoy a relaxing atmosphere where you can watch the sunset while dolphins play in the Gulf of Mexico. Regardless of your room selection, you’ll be delighted with our spacious accommodations. 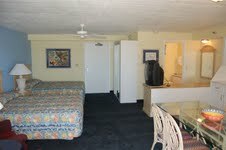 All room types offer microwave, refrigerator, coffee maker and DVD player. King Studio - Gulf Front (KEF4) “F” Units After a day at the beach or a refreshing swim in our large heated pool, this King Studio offers a comfortable bed, and 2 lounge chairs or recliners. Amenities include TV with DVD player, hair dryer, iron, clock radio, and a fully-appointed kitchen with microwave, coffee maker and dining table. Relax on your own private screened-in balcony, and enjoy a spectacular view of the Gulf. Queen Studio - Gulf Front (QEF4) “F” Units Queen After a day at the beach or a refreshing swim in our large heated pool, this 2-Queen Studio offers comfortable beds, plus 2 lounge chairs or recliners. 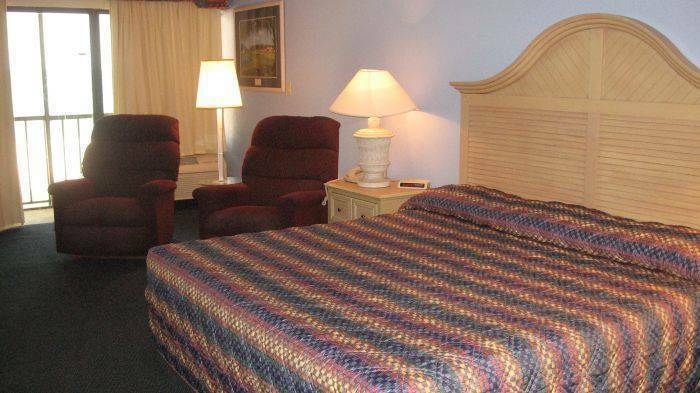 Amenities include TV with DVD player, hair dryer, iron and clock radio, and a fully-appointed kitchen with microwave, coffee maker and dining table. Relax on your own private screened-in balcony and enjoy a spectacular view of the Gulf. Garden King Studio (KEC2) “C” Unit The King Studio offers a wonderful view of our garden patio. Some units have limited views of the Gulf of Mexico. Amenities include TV with DVD player, hair dryer, iron and clock radio, and a fully-appointed kitchen with microwave and coffee maker. Spacious King Studio (KEI5) “I” Unit Overlooking the Gulf of Mexico, these units offer a large spacious guest room (500 sq. ft.) with one king-sized bed. Enjoy 2 La-Z-Boy recliners, large dining table, full kitchen and your own private screened-in balcony. Each I unit has a full refrigerator, stove with oven and microwave. Each room has a DVD player, clock radio, iron, hair dryer and coffee maker. Take the Exit 28A to Park Blvd. Take Park Blvd. due west until you reach Gulf Blvd. Turn left (south) onto Gulf Blvd. The hotel is four miles down on the right. Take I-275 North to Park Blvd. exit west. Take Park Blvd. west to Gulf Blvd. Turn left (south) on Gulf Blvd. The hotel is four miles down on the right.